Gloria was my second pregnancy. Everett is biological and Noelle was adopted from foster care. I was so excited to be trying vaginal birth again since Everett ended up needing a c-section when he got stuck very badly in the birth canal due to posterior positioning. I ended up being dilated to 4cm at 36 weeks, so I had a feeling her birth would be a quick one. Four days before my due date, I bolted awake at 2:15am with what felt like terrible gas pains. Less than three hours later, and only an hour-and-a-half after arriving at the hospital, Gloria was born triumphantly and joyously at 5:05am. It was the most exhilarating moment of my life. The nurses seemed to keep her for her exam such a long time but I had no inclination that anything was wrong. Her face was so super swollen from such a quick birth, I knew she looked different than I expected, but Down syndrome didn’t cross my mind. Our pediatrician arrived at the hospital 6 hours later to do her exam. He congratulated us on a beautiful baby. He said she was healthy. He also said that she had a couple of traits which the nurses suspected meant she had Down syndrome. He said that he couldn’t say with certainty that she did, but that they’d like to do a blood test to be sure. We were shocked. It took me about 12 more hours before I “saw” it and knew in my heart it was true. 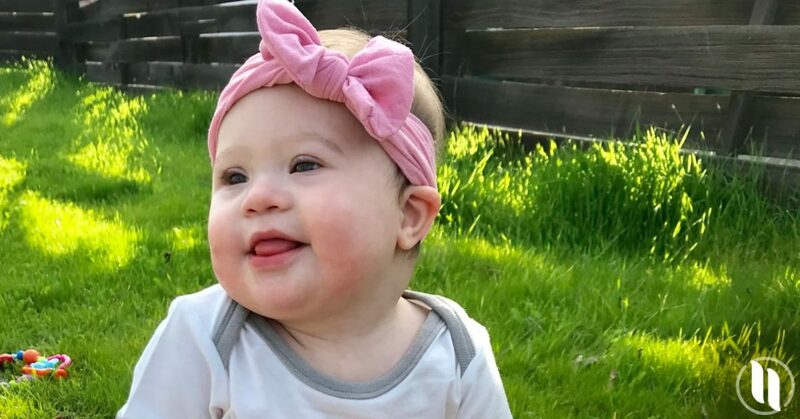 When they tested her pulse-ox at 24 hours-old, she was only at 84, so they immediately took her for an echocardiogram which confirmed her heart defect. Gloria received oxygen and a feeding tube but went home 10 days later strong enough to start breastfeeding and off oxygen. We thought that she would be more fragile or more difficult, but she ended up being the easiest baby I have ever encountered. She slept well. She did not cry. We met her needs and she was content. We were absolutely in love with her and caring for her was a true joy. She learned to breastfeed just like a typical baby, only it was at three-weeks-old. She is beautiful. She is a treasure. She is so content, she seems to be less motivated to learn new skills. She is lucky to have great muscle tone so she doesn’t have the same physical deficits that most babies with Ds have. She is one year old and not crawling or pulling herself up yet, but she is working hard and we know she will get there in her own time. There’s no rush! Raising Gloria has allowed us to treasure every moment, since the baby years are so fleeting. We are taking nothing for granted! Gloria slept through the night from the beginning. She doesn’t cry in the car. She is game to eat whatever I give her with no complaints! She delights in new experiences. She will cuddle just about anyone. Heart surgery is terrifying, but modern medicine is miraculous and we are strong! There are so many safety nets and support systems for families like ours. Gloria loves just being with her siblings. She loves blocks and stacking and singing and clapping. She loves music and being sung to. She loves going to church and socializing. It can be challenging when there are extra medical things. The cardiologist was super intense and I constantly questioned whether I was doing enough for Gloria. Our big kids had a hard time understanding why Gloria didn’t come home from the hospital right away and why she needed so much extra attention. Of course, learning to use an Ng tube for feeding once heart failure got bad was hard. Rectal temperatures are challenging. Feeling like we had to be secluded because her immune system is not as strong has been hard. Change of plans! This girl is different than you imagined she would be, but you are going to love life with her! You are now a part of a community that will bless and enrich you like you have never known. You will see so soon that you are truly lucky to have received this blessing. Same as above! And DO NOT give into the thinking that this hard stuff is going to wreck you. It’s not. You are strong. You can absolutely be what your child needs— love and an advocate. You will do your best and you will question if it’s enough, but just keep going. And when you’re feeling down, call a friend and go out. Get yourself some social time. Take care of yourself! Having a baby is hard, and this one is a little “extra,” but you’re going to LOVE it!